Bharat bandh today: It will be a day of protests in the country as several trade unions, bank employee unions, farmers’ bodies and teachers’ associations are taking part in a two-day nationwide strike against the Narendra Modi government. Transport, banking, education, health, steel, electricity, insurance and other services may be affected as these trade unions, comprising over 20 crore workers, will join the two-day Bharat Bandh. Left parties have also asked its affiliated unions to actively extend their support to the Bharat Bandh call given by these trade unions. The trade unions will also take part in ‘rail and rasta roko’ (stop traffic and trains) protests to demand the fulfilment of a 12-point charter, which includes demands like minimum monthly salary of up to Rs 18,000, mandatory provision of equal pay for equal work, social security provisions, discontinuation of foreign investments in railways, banks and insurance sectors and job guarantee for the unemployed youth, among others. Amarjeet Kaur, General Secretary of All India Trade Union Congress, has said that over 20 crore workers under these unions will join the strike call given against the anti-people policies of the government. Banking services, including cheque encashment, demand draft, ATM, and other services, may be disrupted due to the two-day strike call given by All India Bank Employees Association (AlBEA) and Bank Employees Federation of India (BEFI). Bank of Baroda, IDBI Bank, Indian Bank, Punjab and Sind Bank, and Allahabad Bank have already informed the stock exchange that the scheduled strike will affect banking services. Here are the major highlights of the Bharat Bandh. The farmers will extend support to the ensuing Bharat Bandh strike. 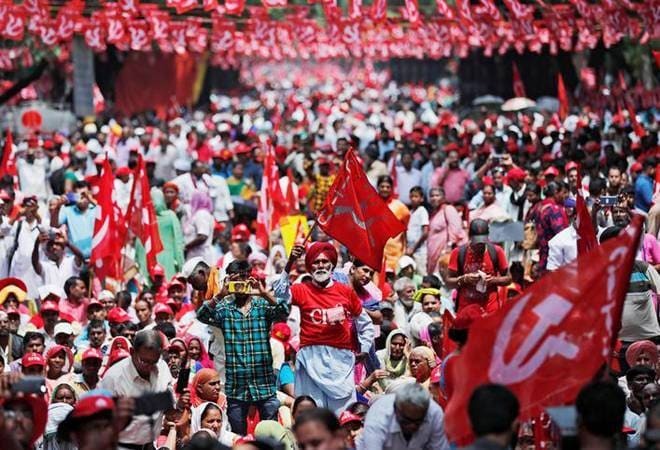 Hannan Mollah, General Secretary of the CPI(M)-affiliated All India Kisan Sabha said AIKS and Bhumi Adhikar Andolan will observe ‘gramin hartal’, rail roko and road roko on January 8 and 9, the day trade unions are observing the nationwide general strike. He said the move is against the Modi government’s failure to address rural distress issues, to save rural farmers’ lands from the corporate. Ten central trade unions, comprising over 20 crore workers, who have jointly called for the nationwide general strike are INTUC, AITUC, HMS, CITU, AIUTUC, AICCTU, UTUC, TUCC, LPF and SEWA. The trade unions have the support of almost all major independent federations of central employees, state employees and the employees of banks, insurance, telecom, and other service sectors representing the workers and employees of all the industries and services including transport services, both in organised and unorganised sectors. All educational institutions including schools, colleges and universities in Odisha will remain closed on Tuesday in view of the two-day nationwide strike called by central trade unions. A notification to this effect was issued by the Higher Education Department on Monday. The BJD government and its trade union front — Biju Sramika Samukhya (BSS) — have also extended support to the two-day nationwide strike. These trade unions are protesting for the demands including recognition for skilled workers who are genuine, inflation control, a minimum wage of Rs 18,000, equal pay framework, no FDI in major sectors like banking and railways. The CITU has denounced the government’s move to amend the Trade Union Act 1926 to bring about “so-called transparency” and avoiding “duplicity” as mentioned in the press briefing. It alleged the proposed Trade Union (Amendment) Bill, 2018, as cleared by the Cabinet, is designed to “impose slavery on the working people”. Major unions that will participate in the strike include the Bank Employees Federation of India (BEFI) and the All India Bank Employees’ Association (AIBEA). Other unions who could extend their support include the All India Bank Officers Confederation (AIBOC), the National Confederation of Bank Employees (NCBE) and the National Organisation of Bank Workers (NOBW). All these trade unions operate under the United Forum of Bank Unions, an umbrella organisation of nine unions that claims membership of 10 lakh officers and staffers. Meanwhile, the Centre through a notification has advised these government employees not to “resort to or in any way abet any form of strike in connection with any matter pertaining to his service or service of any other government employee”. Any violation of government rules may attract disciplinary action against the employee concerned, the notification says.